One thing we can be sure of is that change is a constant theme in our lives. Sometimes we cling to things from the past, because they’re associated with special memories. 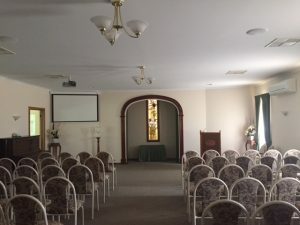 That’s the case with many of the items we have here, because our buildings and Chapel were set up when our business was in its infancy, back in the late 1980s. Prior to the 1980s, most funeral ceremonies were held in the church. But with declining religious worship and increasing secularism during the twentieth century’s last decades, people began asking us if “we could hold a ceremony at our place”, rather than in the church. So in response to the public need, funeral directors set up facilities where such services could be held. Ron Cunningham and his team built our chapel, and Ralph made the original pews from Australian Oak. They were covered in an autumn-toned fabric to complement our Chapel furnishings – which reflect our rural surroundings. With the changes from church to chapel, the pew seating was fine for a long time. But then gradually, we realised that a more contemporary look could be achieved by discarding the pews, in favour of individualised seating. In fact, individualism has extended to many areas in our current era. Families now, in many cases, determine what type of funeral is required, and what will happen. This is in stark contrast to the way funerals used to be, for when I began in funerals, it was the church which controlled most facets of a funeral ceremony. Coast and Country Furniture in Port Lincoln gave us wonderful service in providing the new chairs, and no detail was overlooked. The old pews continue to be used too – Malcolm Schluter took some for use at Nyroca, and Peter Feltus took the remainder, for the Colley Hall.